Brandon Holzhueter (left) and Brad Merten at Narwhal's Crafted Urban Ice. 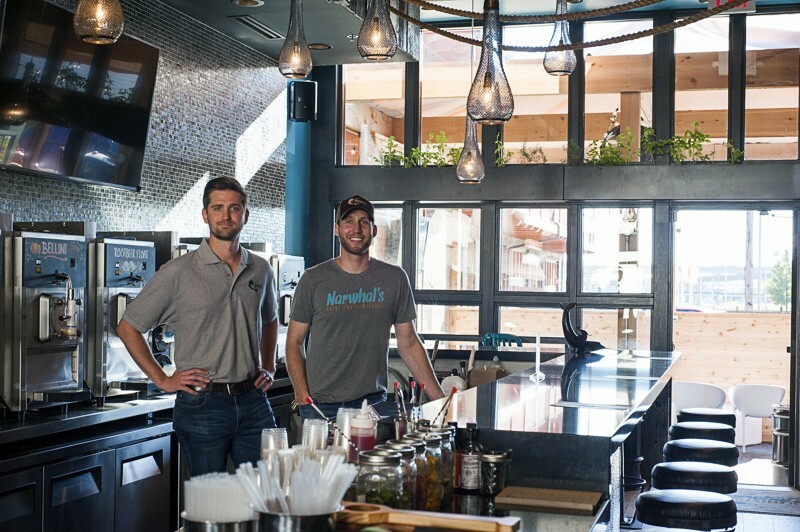 If you ask Brad Merten and Brandon Holzhueter when inspiration struck for Narwhal's Crafted Urban Ice (3906 Laclede Avenue, 314-696-8388), the longtime friends laugh. "Well, how far do you want to go back?" asks Merten. "I guess eighth grade." Granted, Merten and Holzhueter weren't planning the ins and outs of their frozen drink bar while they wandered the halls of Parkway Middle School together. That didn't happen until they both graduated from Mizzou and were on vacation together in Florida. Merten had finished up his degree and was managing two locations of the sandwich chain Pickleman's Deli in Columbia, while Holzhueter had gotten his C.P.A. license and was working as an accountant in St. Louis. Merten knew he had found his calling in the hospitality industry, but Holzhueter was having doubts about his nascent accounting career. "I loved accounting and numbers," explains Holzhueter. "I just didn't like doing it for other people." As the friends imbibed beachside frozen drinks, they lamented the fact that such delicious concoctions were relegated to coastal vacations. They hatched a plan to change that, and came home with the idea for Narwhal's. It would have to wait, though, as the pair busied themselves by opening two Pickleman's Deli locations in St. Louis. It was an uphill battle — with each man just 24, no one would take their ambitions seriously. "I guess the upside of that was that we were so young that we didn't have anything to lose," Merten says. "The downside, though, is that we didn't have two pennies to scrape together, and no one would lend us money. "I think most people would have given up after hearing 'no' 40 times," adds Holzhueter. "Our friends and family were all telling us we were crazy going into business together." The partners prevailed, and parlayed the success of their sandwich shops into their dream for a frozen adult beverage lounge. Though they acknowledge that people inevitably think of college-kid mayhem when they hear the word "slushy bar," Merten and Holzhueter say people are surprised when they walk inside and see how nice the place is. "Our goal it to create a place where people don't want to leave with a to-go cup — they want to stay," says Merten. 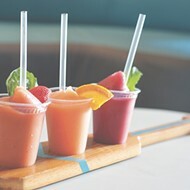 To that end, they've created a comfortable, polished atmosphere and stocked their bar with sophisticated concoctions in the hopes that people will change their perceptions about what it means to drink a frozen beverage. And as for their friends and families' fears that they would ruin their friendship by going into business together, they just laugh. 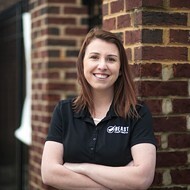 "Brad knows all of the front-of-house stuff and has the hospitality background. I know all about the books and the numbers. It allows us to stay off of each other's toes," says Holzhueter. "We joke that together we make one really good owner." Holzhueter and Merten took a break from preparing the concoctions for Narwhal's new hot bar element (think Irish coffee and hot toddies) to share their thoughts on the St. Louis food and beverage scene, what you'll never see in one of their drinks and that, in fact, they are not brothers. Brad: I love music – couldn’t live without it. I’d say 90 percent of my waking hours I’m listening to music. Favorite band you ask? How could anyone answer that; there is just too much good music out there these days. Brandon: I recently learned how to juggle. Well, I’m still perfecting it. Also, that Brad and I are not brothers. Amazing how many times we get asked that. Brad: A cup (or two) of black coffee in the morning – some nights I go to bed already looking forward to having it in the morning. Brandon: Play time with my two kids, Carter (six) and Claire (21 months). It’s good for the soul… allows me to forget about work for a while and recharges my batteries. Plus they enjoy it, too. Brad: That’s easy. The ability to stop and start time, Zack Morris-style. There is just not enough time in the day. Brandon: Brad took my answer. That’s exactly what I was going to say. Guess we were both big Saved by the Bell fans. Brad: More restaurants adapting to a fast-casual approach, while continuing to put out quality dishes. Quick service is in my blood and I love to see and go to restaurants like Porano, Seoul Taco, Yolklore, Wicked Greenz, etc. that are giving people healthier fast, casual options other than fast food. Brandon: The arrival of the ramen shops. I love the stuff. Actually there’s a pretty good one just down the street from Narwhal’s — Midtown Sushi. Brad: Mike Randolph of Publico. I’ve had some of the best meals of my life at his restaurant and there’s nothing else like it in St. Louis right now. Brandon: Qui Tran, of Mai Lee. Brad: Might be a cliché answer, but it has to be Gerard Craft. His restaurants and menus have continually been setting the bar for the St. Louis food scene and have helped push other young chefs in the area to follow suit and get really creative in the dishes and flavors they put together. Sardella is on the top of my “go to” list currently. Brandon: Tait Russel (and his family) of Charleville Brewery. Full disclosure, he’s my wife’s cousin, but they are opening a brewery/tasting room off Chouteau. Incidentally, they are partnering Paul and Wendy Hamilton for food there, which is exciting. I went to the preview, and it’s going to be great. They’ve always had some great products, but I think with this anchor in St. Louis (they started in St. Genevieve) you’ll be seeing even more of their stuff around town. Brad: I’d say lets go to Yolklore for breakfast, Porano for lunch, Side Project for afternoon beers, Reeds American Table for dinner, then have a nightcap at Planter’s House. That lineup can compete with any other city in the country. Brad: I’d be making killer sandwiches. But for real, when I’m not behind the bar at Narwhal’s, I’m slanging sammies at Pickleman’s. And let's be honest, sandwiches were my first real love. Brandon: Professionally? I would be working a 9-to-5 office job somewhere in the world of finance with my nose to the grindstone hoping someone notices me for a promotion. I’m happier behind a bar. Brad: I don’t discriminate ingredients – anything is fair game! For me personally though, keep the olives and olive juice far away from my drink. Also any of that fake, artificial stuff. Brandon: I like olives, but otherwise I echo Brad’s thoughts. High fructose corn syrup is something that we have worked to avoid using in our drinks at Narwhal’s. Brad: At home with the wife and baby – I wouldn’t want it any other way. (And no, my wife did not make me say that). Brandon: My couch. Is that too boring of an answer? Brad: The #76 – Com Dac Biet from Mai Lee. It never lets me down – so good. Brandon: Currently, my son’s Halloween candy. Brad: I’d keep it simple – burger and fries. Now it would have to be a damn good burger and fries. I’m thinking bison burger, dollop of pub cheese, healthy serving of caramelized onions on a toasted onion bun with hand-cut sweet potato fries seasoned with cinnamon and cayenne pepper. Add a side caesar salad and an Urban Chestnut Winged Nut – I’d go a happy man. Brandon: I’d probably take a plate from the crawfish boil my in-laws do every year, because it’s delicious and elicits lots of good memories. Then I’d finish it off with a sazerac sitting by the fireplace at Fox & Hounds. Then I could die happy.